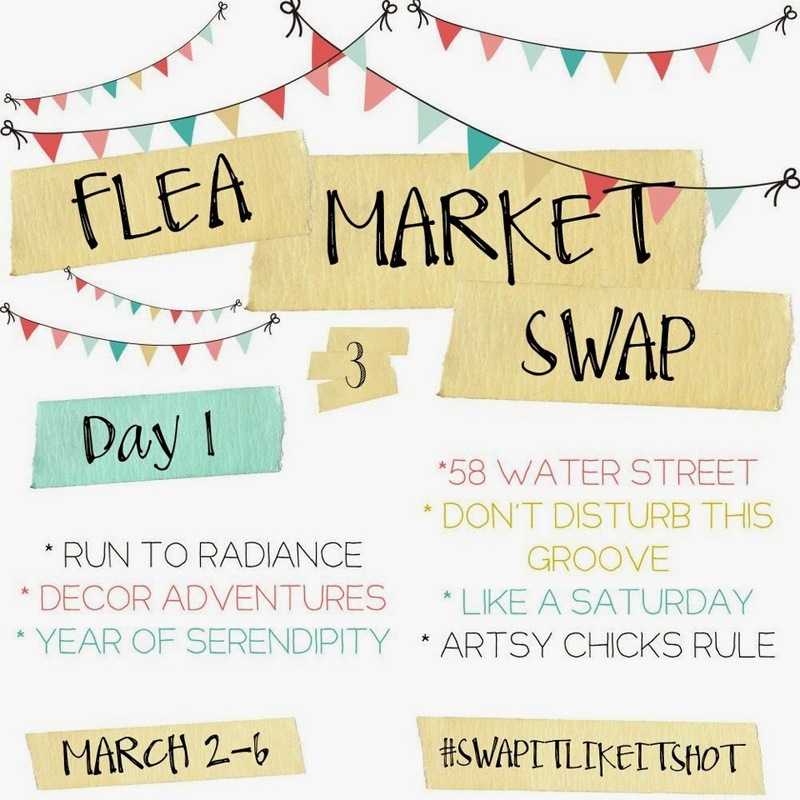 58 Water Street: Flea Market Swap 3 - The Big Day! Flea Market Swap 3 - The Big Day! Last week I talked about 'Flea Market Swap 3' organized by Charlotte from Ciburbanity. You've probably spotted Charlotte on the back page of the March issue of BHG, in her beautiful lavender living room. A lot of planning goes on behind the scenes of these projects, so a big thanks to Charlotte for organizing all of this! I used leftover paint from the foyer chair rail project, which is an ivory semi-gloss. 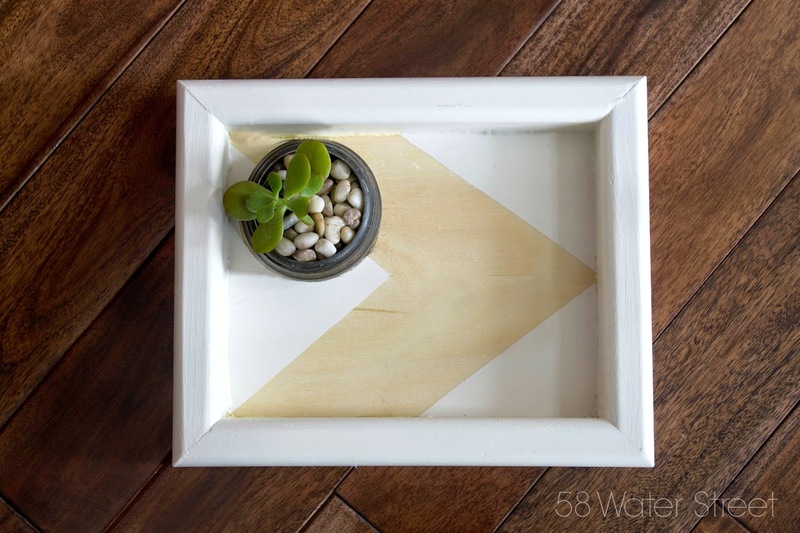 I knew I wanted a "wood & white" combination for the bottom of the tray, and I wanted to keep the design simple. The bottom is made of two very thin pieces of plywood from Michael's, which Jason cut to size. If you look closely you can see a seam in the middle, but please don't look closely. :) I covered the tray bottom in a light natural stain, then taped and painted the arrow before gluing the wood to the frame with a hot glue gun. Total cost: $2.30 for the wood, all other supplies were already on hand. 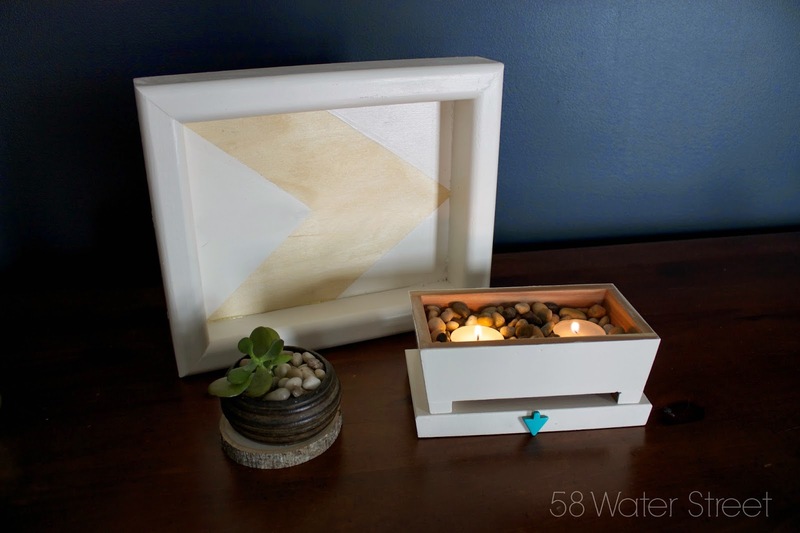 The possibilities were endless for this jewelry box. I could have gone crazy with color, adornments, stenciled patterns, etc. With so many options, I went in the opposite direction and chose to keep it as simple as possible. I also wanted to keep the aesthetic of these three items similar enough that they look good together in a single picture. So after sanding off the high-gloss stain & majestic horse scene, and removing the cheap gold hardware, I filled in the holes and applied two coats of the same paint that I used on the frame/tray. I left the inside untouched because it's cedar and who paints over cedar? That smell is heavenly. I attached a turquoise arrow-shaped bead with hot glue, but left the hardware off. I like that the lid comes off completely. I thought about filling the inside with dirt, stones, and a succulent, but I don't want to the be lady who fills everything with dirt, stones, and succulents. Stones & candles it is. Total cost: $6.30 for the string of turquoise beads, but I only used one. Well this was fun! Please visit the other ladies to see their transformations...we'll be here all week! Love what you did! and Dance Moms... gives me heartburn and I still keep watching! Thank you! Dance moms is a total guilty pleasure. I can't quit it. 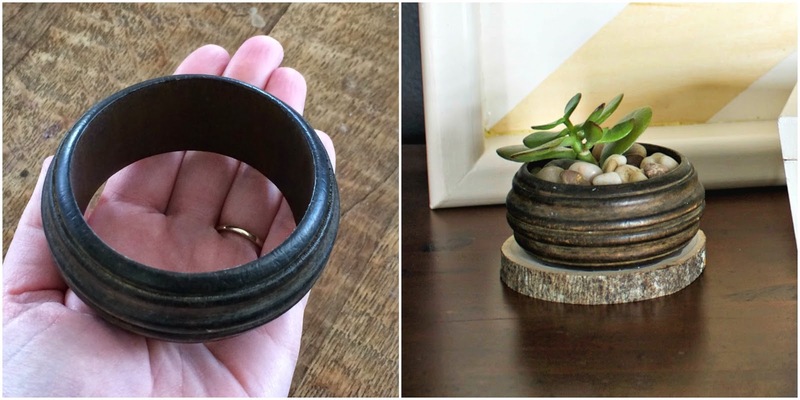 How smart to glue the ring to the wood round and use for your succulent! 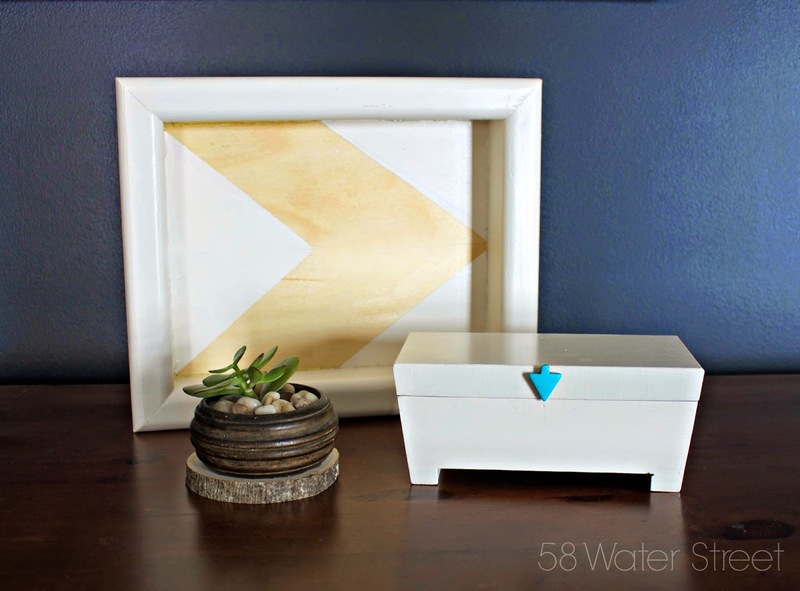 Great makeovers, I'm loving the arrow on the tray, tres chic! Horse motif...um, no. :) Thanks Jessica! I sure did Karen! Thanks for the excellent thrifty treasures! I love your makeovers and your bit about the Kardashians really cracked me up! Thanks so much for sending along a great package to me. I loved everything!! I'm glad you liked it - thanks for the kind words! Oh Real Housewives! I watch the New Jersey edition. Love it! Such fun transformations! That petite succulent planter is just adorable! 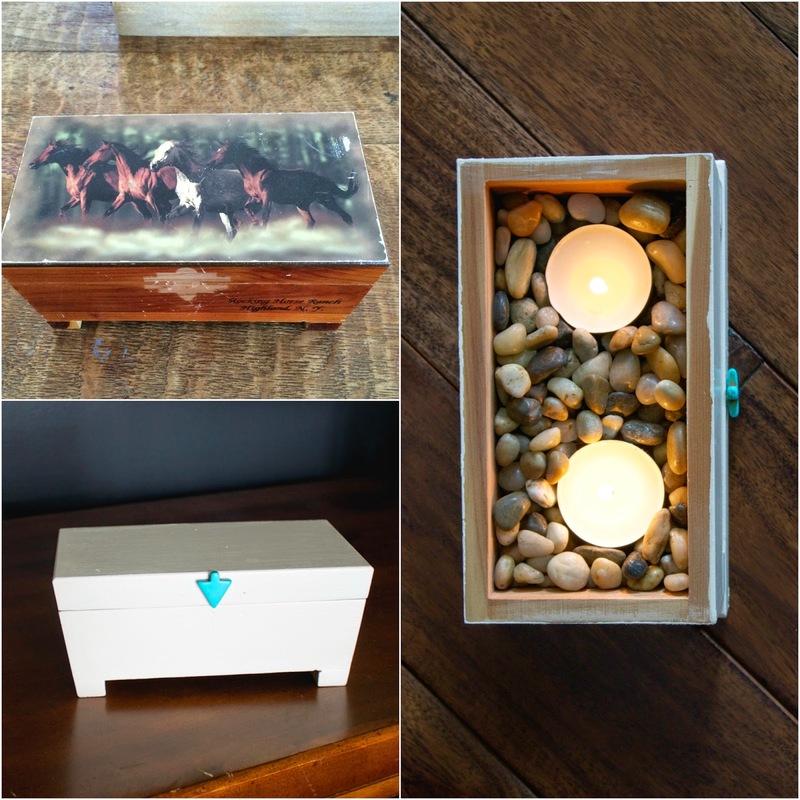 Colleen, I love what you did with these items! 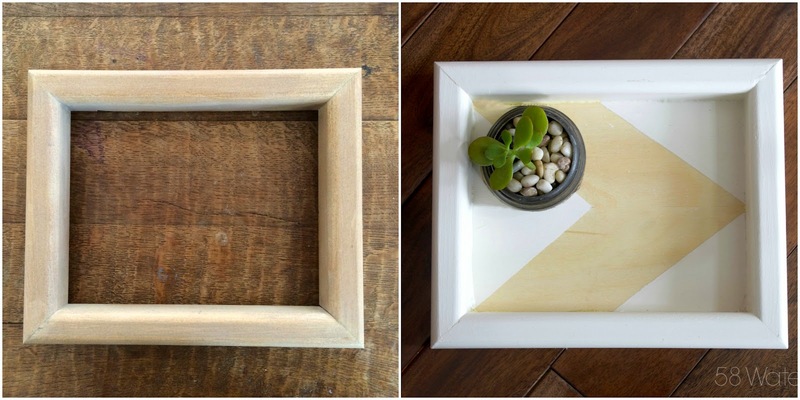 The arrow tray is so chic, and the tiny succulent planter is just perfect! Love that you left the inside of the jewelry box au naturel- that smell is truly heavenly!! Sad for you that the balsa wood failed but that slice more than makes up for it!! love your white/wood modern art! looks awesome! Your little succulents planter is adorable!! Fabulous remakes! While I don't have the imagination for this type of challenge, it sure is fun to hop along and see it in person. Your candle holder is really pretty! That succulent holder!!!! I would buy that if I ever saw it in a store...I guess I'm on the hunt for a wooden ring now. Great transformations! I love that chevron art!! !